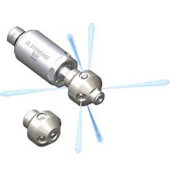 Self-rotating nozzle for cleaning pipes from 6 – 72 in. (150 – 1800 mm) with flow up to 200 gpm (760 l/min) at pressures up to 10,000 psi (700 bar). 30 – 80 RPM. Pipe cleaning nozzle. 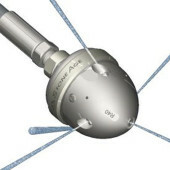 1/2″NPT Inlet, Four 1/4″NPT nozzle ports. For pipes 2 – 8 in. (50 – 200 mm). Working pressure up to 10,000 psi (700 bar). Pipe cleaning nozzle. 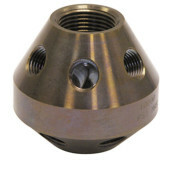 3/4″NPT Inlet/outlet, Twelve 1/4″NPT nozzle ports. For pipes 3 – 12 in. (75 – 300 mm). Working pressure up to 10,000 psi (700 bar). Pipe cleaning nozzle. 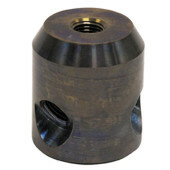 1/2″NPT Inlet/outlet, Four 1/4″NPT nozzle ports. For pipes 3 – 12 in. (75 – 300 mm). Working pressure up to 10,000 psi (700 bar). Nozzle head for 10K or 15K BJV. 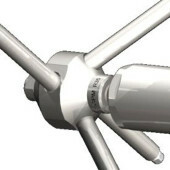 Six 1/2″NPT ports to accept pipe extensions. 15K BJV flow from 40 – 60 gpm (150 – 225 l/min); 10K BJV flow from 50 – 85 gpm (190 – 320 l/min). Includes port to accept pulling ring. Nozzle head for 10K or 15K BJV. 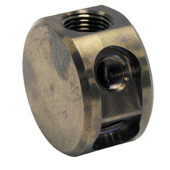 Six 1/2″NPT ports to accept pipe extensions. 15K BJV flow from 70 – 100 gpm (265 – 380 l/min); 10K BJV flow from 85 – 150 gpm (320 – 570 l/min). 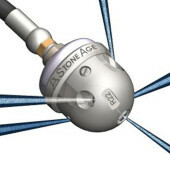 Includes port to accept pulling ring. 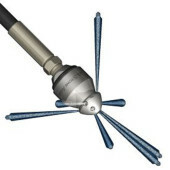 Self-rotating pipe cleaning nozzle negotiates 2″ pipes with muliple elbows. 15,000 psi (1000 bar). Self-rotating pipe cleaning nozzle negotiates 6″ pipes with muliple elbows. 33 – 55 gpm at 15,000 psi (125 – 208 l/min at 1000 bar).